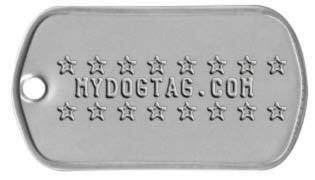 PMFRC Canadian Military Dog Tags Generator: Personalized Identity Disc ID Dog Tag for people. 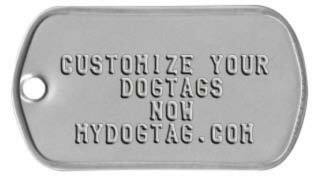 Design & order your own custom PMFRC Canadian Military Identity Disc Dogtag! Military Families...Strength Behind the Uniform! Is your child dealing with a deployment? We have something special just for him/her! This unique Canadian Forces Identity Disc replica is offered free of charge courtesy of the Petawawa Military Family Resource Centre (PMFRC). You only pay CAD $5 + HST for shipping! Contact the PMFRC at deployment.pmfrc@bellnet.ca if you have any questions. Line 1: Space inserted to avoid hole. The Flipside of the PMFRC tag cannot be customized since it is engraved with the PMFRC / MFSP Logo.